Mommy and Tee: SMH, Golfsmith. So today I took a club to Golfsmith to get it regripped, toddler in tow. He loves that store, lots of things to grab and space to walk around. The sound it makes when I hit a ball in their demo area is hysterical to him. I headed straight to the back of the store and was waiting (and waiting, and waiting) to be helped, so much that I had already picked out the grip I would need (basic black, undersized, no wraps). Finally an employee who was escorting a different customer to the tech area found me. He left them and I alone to go get another guy since he didn't "do grips." After I had finally gotten the help I needed, I spent some time wandering the store with the kiddo so he could run out some energy (and I could peruse the merchandise!). Kiddo was getting in the way of a third customer rolling some putts on the green. I tried to wrangle him when the employee exhales, "OH, you're with him!" I look over and he's pointing to the customer putting. It's as if now my presence made sense, the conundrum finally solved to his relief. No, we're not, I tell him. "Oh," he says. I get that I must look a little funny shopping at a golf store with a toddler, but surely this man has seen women even without children shop in his store, right? I see some Hank Haney chipping nets on sale and decide to grab one to give a try, since right now I use the kiddo's wagon and some other toys for targets (#momlifegolf). Still in the area, the employee comments that I've found a great item. "Will it be used indoors or outdoors?" he asks, eager to talk about it. 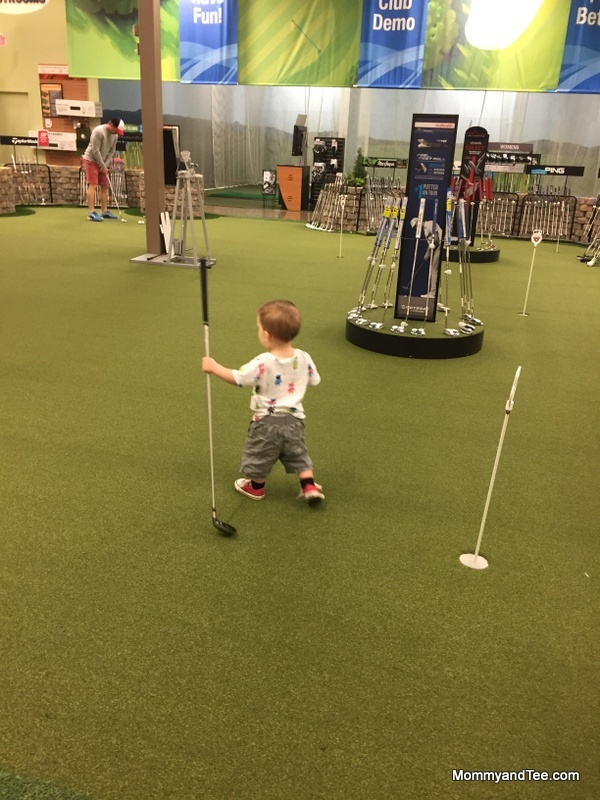 Mostly indoors, I say, my hands full as I try to keep the kiddo from knocking over an entire row of putters. "Well it's great for that," continues the employee, "does he have any of the plastic yellow balls for indoor chipping? He would need those, they're really great for him to practice short game!" Ohhhhhh, this guy wants to know if the man he assumes I'm shopping for needs anything else. No, I have some already, I say, emphasis on the I, and head to checkout. There was nothing more I felt like needing to be said. He wasn't rude, per se, just ignorant. It wasn't insulting, just disappointing, and actually I was a teeny bit embarrassed for him. I was wearing a golf hat, for Pete's sake. I had picked out an undersized grip for a women's hybrid iron, which he saw me carry in. The clues weren't super obvious I guess, but definitely there. SMH. Let me say that I don't feel like I've suffered a ginormous transgression or have been discriminated against. This is obviously a #firstworldproblem, just annoying. But on the plus side, it kept me from spending much more money, because I was about to drop some dough on full-price new polo styles, and maybe a cute gingham print visor. Dodged one there!